When it comes to road refurbishing, The Crusher from Iron Wolf is ideal for breaking down even the largest rocks on your work site. With sustainability in mind, The Crusher will effectively pulverize rocks and debris, turning them into dust or gravel that can be used elsewhere. Use the gravel for other road refurbishing jobs or construction projects with which you are involved. Plus, you benefit from not having to transport unwanted or leftover rubble to landfill, as well as not having the cost and carbon footprint associated with travel. For optimum mobility, the Crusher is designed to be attached to the front of the wheel and track loader you are using on your road refurbishing site. Move the loader to the location in which it is needed, and set about crushing and grinding everything in your path. The 1000 series includes a cutter assembly 138 X 88 X 50-inch and a 10-foot wide (120-inch) cutter drum. The cutter drum is available in two different diameters to suit the cutting depth you require. The 40-inch diameter will enable cutting depths of 12 inches, and the 48-inch diameter is suitable for depths of up to 16 inches. Crushers work by applying pressure to the material to be crushed, and for this you need a powerful engine. The IronWolf Crusher is the best machine for your crushing needs during a road refurbishing project. With cast iron and cast steel jaws, the Crusher is strong and durable enough to deliver the power you need to crush rocks of all shapes and sizes. The 115 X 54-inch auxiliary engine package is mounted on the rear of the loader. The engine type is a Caterpillar® C-15 turbocharger and air-to-air after cooler, providing 502 SAE net hp (375 kW) of rated power at 2,100 rpm (540 SAE 403kW gross hp). As well as road refurbishment, The IronWolf Crusher is suitable for construction, reclamation, mining, and forestry applications. 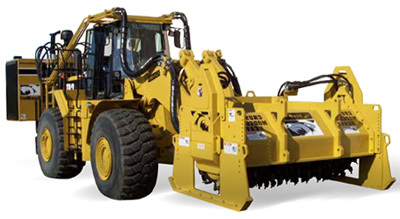 The recommended carrier machine is CAT 966, John Deere 824-J, or an equivalent or larger wheel loader. The perfect crusher for asphalt and rock, the IronWolf Crusher is the ultimate machine available for road refurbishing projects.